It’s a common misconception that restaurant patrons are put off by the “impersonal” touch of technology. Believe it or not, the vast majority of customers actually prefer it. A recent study found that 79% of customers believe restaurant technology improves the guest experience. It’s clear to see why: with automation, the temperature is always cool and comfortable, the lights are never too bright or dim, the music is at just the right sound levels for easy conversation, and guests never have to wait on a busy server just to get the check. In short, automation works in the background to create the perfect environment for your restaurant. As beneficial as this technology is for your customers, it’s also a great cost-saver for business owners. The automation system intelligently monitors your restaurant’s energy usage and can even adjust the temperature, lights, etc. to take advantage of opportunities to save energy without compromising on the atmosphere. More than that, automation takes time-consuming, manual tasks and makes it easy to accomplish everything in seconds. At the end of the day, all your staff has to do in order to close the restaurant is press the “Close” button on the integrated touchscreen. Instantly, the shades will lower, the electronics will power down, the lights will turn off, the thermostat will adjust, and the security system will arm. SEE ALSO: What Can Commercial Automation Technology Do For Your Business? Once you decide that automation is a good idea, you get to move on to the fun part: choosing the technologies to adopt in your business. The sky really is the limit for what you can do with commercial automation, but we’ve outlined the most popular and effective starting points below. Commercial Security: Upgrade security while also simplifying system management by integrating your door locks, surveillance cameras, alarms, and more into your automation system. Arming/disarming the system each day is as simple as pulling out your smartphone and entering a code. Lighting and Shading Control: Add motorized window treatments and smart lighting to enhance ambiance while also saving on energy costs. The shades and lights can automatically react to available natural light, setting the right mood no matter what time of day it is. Audio Video Systems: Whether you want a high-definition video wall for your bar or a subtle music system for a high-end restaurant, automation technology makes it super simple to control all of your AV equipment from one central remote or smart device. HVAC Control: Make it easy to ensure your restaurant has the perfect temperature inside, no matter what the weather is like outside. 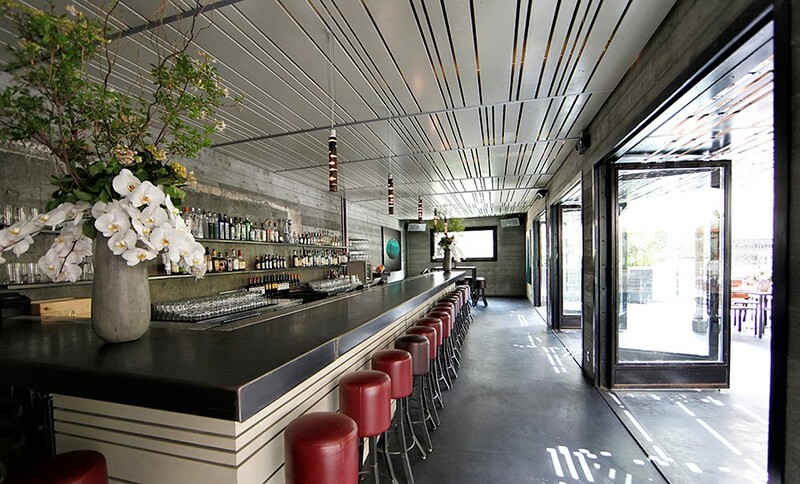 With smart climate control, your restaurant or bar can balance comfort and energy savings. Self-Service Interfaces: Give your patrons the freedom to order and pay with an interactive tablet at each table. While they wait for their food, your customers can enjoy playing games on the touchscreens. After the meal, you can ask them to fill out a brief survey right then and there, giving you instant feedback about meal quality, server performance, etc. Are you ready to explore the possibilities for automation in your restaurant or bar? Give us a call at 480.361.9500 or fill out this quick form, and we can chat about the best solutions for your business.